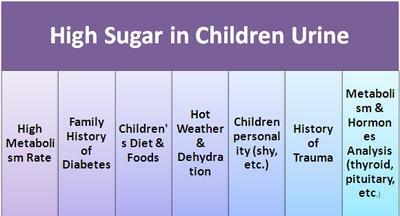 QUESTION: My six year old daughter has consistantly high sugar in urine (not ketones). She has been checked out by a paediatrician. Her blood sugar is normal, kidney function normal, ultrasound normal, glucose tolerance test normal. What is wrong? The doctor doesn't seem to be able to find it? any ideas? she is not on any meds and has a normal diet. Children have higher metabolism rate than we (adults) have, especially when it comes to growth hormones "games". Furthermore, sometimes, there are certain things that happen to children that are "strangely" normal, and would disappear with time. To me, you should keep screening your child for blood sugar tests regularly (discuss with her pediatrician how often you can do this) to catch any probable diabetes in time. This is particularly true if you have any family history of diabetes. Another explanation could be related to the diet your daughter is following. You say it is a normal. Perhaps (to my virtual judgement) you are adding caloric foods (sugary ones like candies, honey, or other ones). Whatever we eat, it is reflected in our waste products (urine and feces). Try to reduce them up and repeat the test to see if there are changes. You can also discuss with her pediatrician for the best menu according to her age needs (because at this time she needs energy). Is it hot in the place you live? Sometimes, when it is hot, and children are very active, they sweat a lot. But, this is reflected to an increased urine concentration, consequently high sugar in urine. Try to give your daughter lots of fluids (I prefer natural mineral water as it would provide with fluids and minerals your child needs for the daily activities). Another alternative is that some children are shy or very "occupied" studying or playing. Therefore, they forget to go to bathroom. When the urine is held for long time, its concentration could turn falsely high. Has your child had any trauma recently? If you are not aware of any, please talk nicely to your child and ask if she has fallen or somebody has hit her at school, for example. Please connect the time you started to notice her high sugar level in urine with the time of trauma. Talk to the doctor immediately once you find out she had a trauma. I would like to check her metabolism and her hormones of thyroid, pituitary, etc, for better understanding. Please discuss with her pediatrician about the above alternatives (if you did not do until now) and see what is the best for your child. Why is my blood sugar level higher first thing in the morning? Why do I wake up with blood sugar level as high as 300? Perform A1C Test At Home! Ask the Doctor now? Simply click here to return to Type 1 diabetes information.